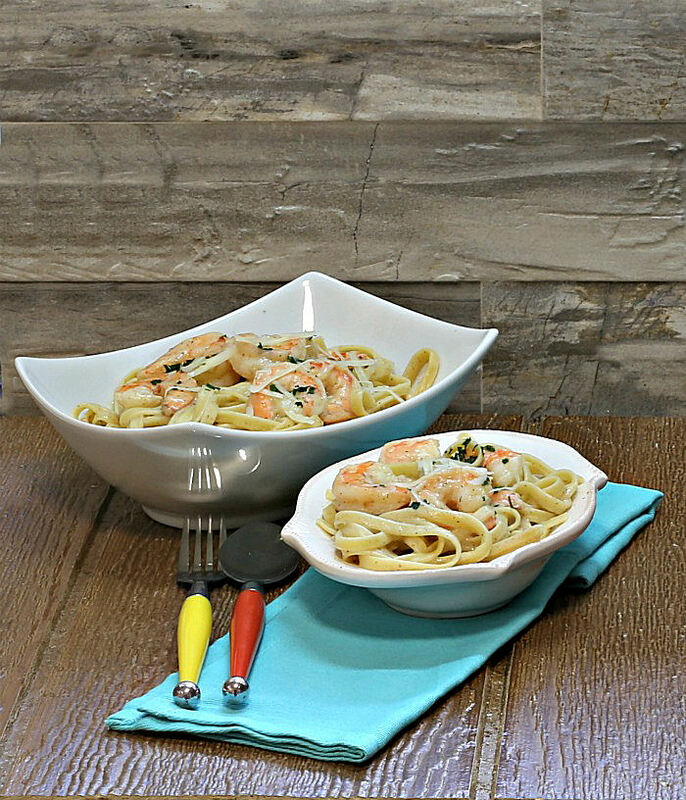 This skinny shrimp Alfredo recipe has been slimmed down from the traditional dish to save lots of calories without skimping on the flavor. The sauce is creamy and silky without the need of heavy cream and limiting the cheese gives plenty of taste but a light finish. It is one of my favorite shrimp recipes. 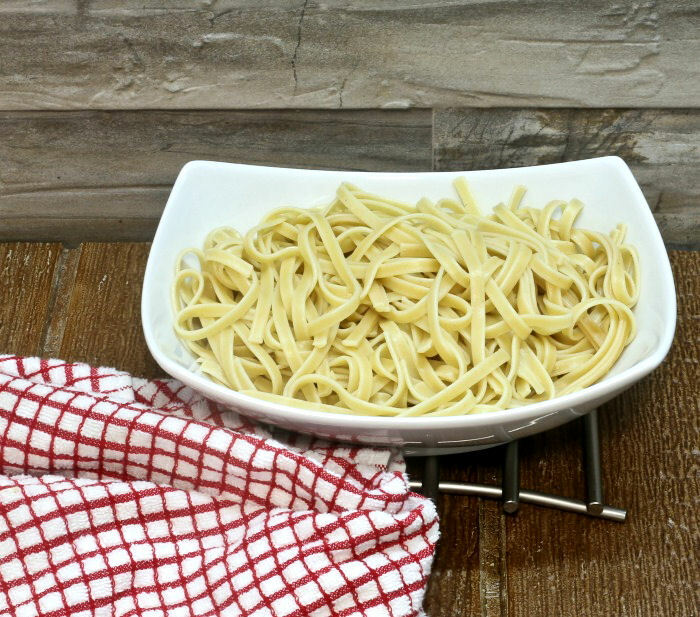 Creamy pasta dishes are a hit in our house when the weather is still cool in the spring. Most of the time they are pretty heavy though and, tonight, I want my pasta comfort food to be slimmed down a little. 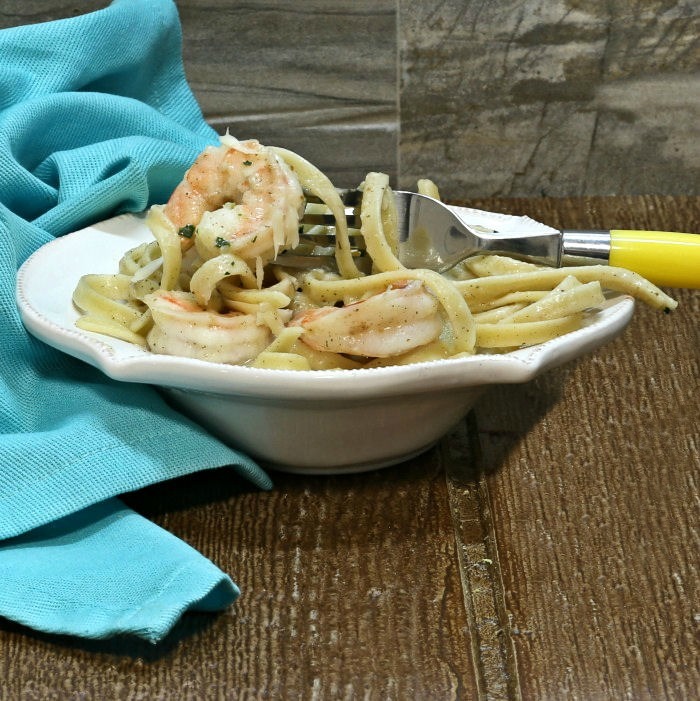 It didn’t take many adjustments to turn this into a healthy shrimp & fettuccine recipe. Lightening up this dish means using 2% milk and fat free chicken stock in place of heavy cream and keeping an eye on the amount of cheese used. I used normal pasta and flour but you can substitute gluten free fettuccine and arrowroot to keep the meal gluten free. I chose fresh Parmesan. 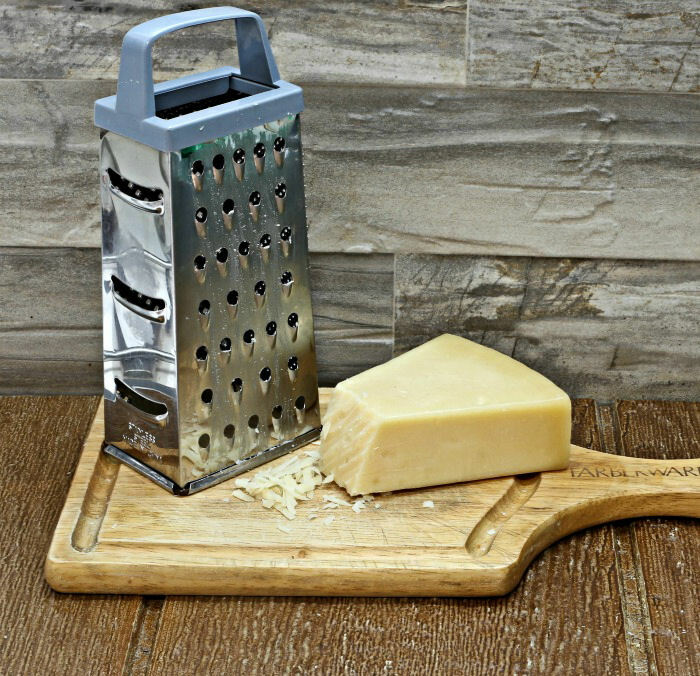 The flavor of it is so much more intense than bottled Parmesan which means you don’t need to use as much. Nutmeg and sage also add a nice bit of flavor with virtually no calories. Start by cooking the fettuccine in boiling salted water according to the directions on the box and then drain and set aside. While the pasta is cooking, heat the oil in a sauté pan and cook the shrimp for 2 minutes on each side until it is nice and pink. Be careful not to over cook it or it will get tough. Set aside and keep warm. Add the garlic to the oil and gently cook and then stir in the flour and sage to make a seasoned roux. (See tips for making a roux here.) Heat for a minute and add the chicken stock, 2% milk, pepper and nutmeg. Bring to a boil and then add the cheese, lower the heat and gently cook for about 3 minutes until the sauce thickens. By now the pasta will be cooked and drained. Add it to the Alfredo sauce and then stir in the cooked shrimp and combine well. It’s starting to look so yummy! 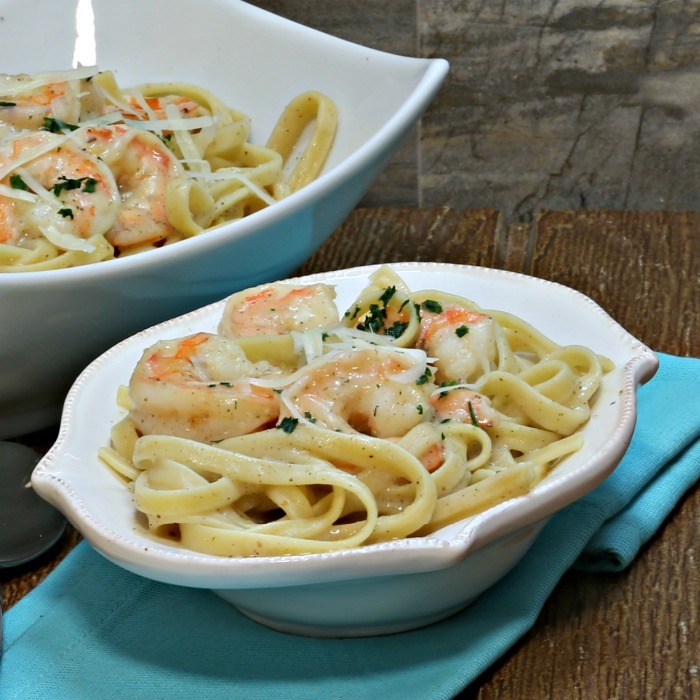 The flavor of this skinny shrimp Alfredo is creamy and tangy. The cheese and spices give it a lovely taste and I don’t mind it not having the cream. I like it when I can eat a rich dish and not feel stuffed at the end. This recipe makes four servings with 506 calories each. It is high in protein and fairly low in saturated fat and shows that you CAN enjoy your favorite comfort food recipe without breaking the calorie bank. Compare those calories to the recipe from the Olive Garden at a whopping 1150! 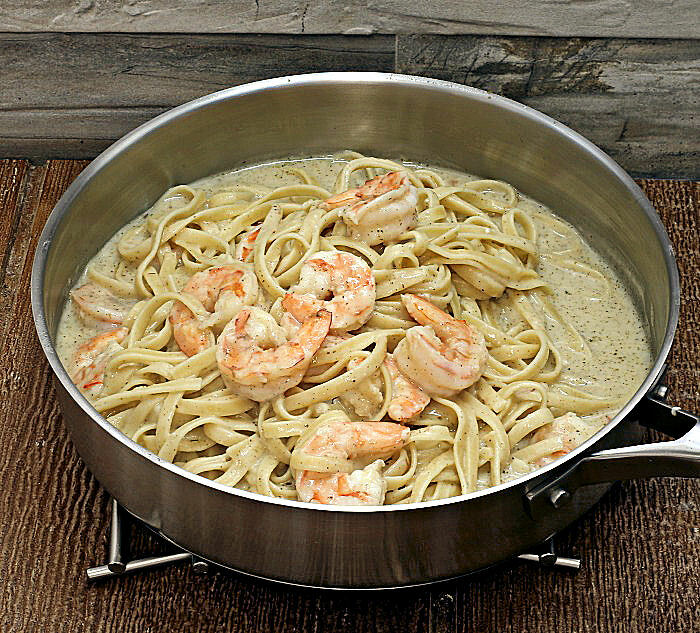 This skinny shrimp Alfredo recipe has been slimmed down from the traditional dish to save lots of calories without skimping on the flavor. The sauce is creamy and silky without the need of heavy cream. Bring a pot of salted water to the boil and cook the fettuccine according to the instructions on the box. Drain and set aside. 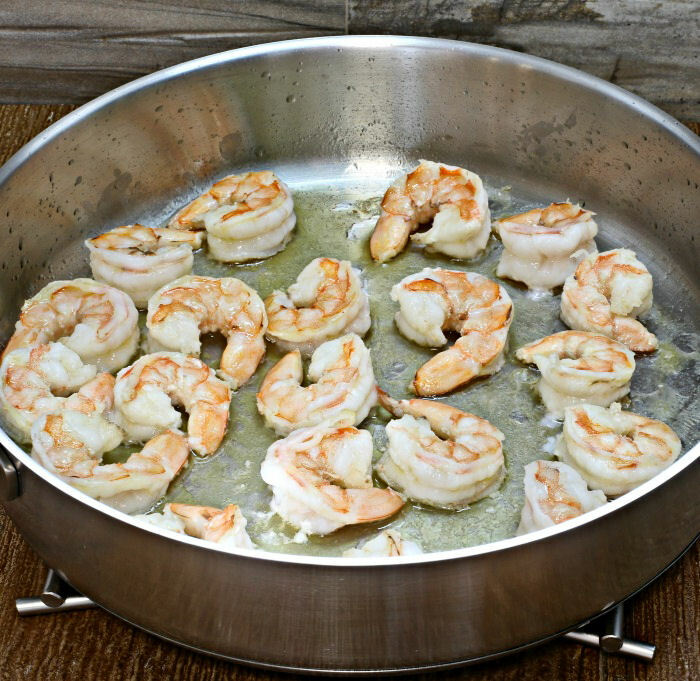 While the pasta is cooking, heat the olive oil in a sauté pan and cook the shrimp on both sides until it is pink. Set aside and keep warm. Add the garlic to the pan and gently cook, scraping up the bits from the bottom of the pan. Stir in the sage and add the flour to make a roux and cook gently 1 minute. Whisk in the chicken broth, milk, pepper and nutmeg. Gently cook until the sauce starts to thicken and is creamy. 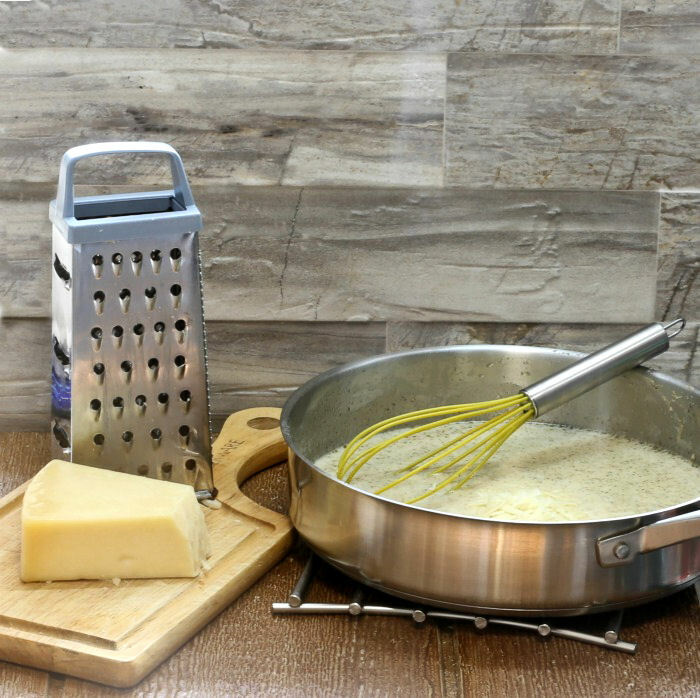 Stir in the grated Parmesan and cook another minute or two. Lower the heat and simmer, stirring gently until the sauce is thick. 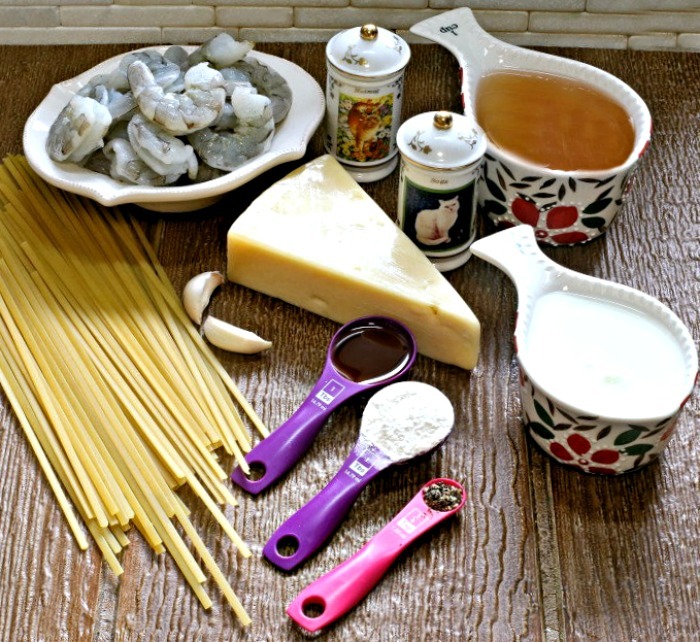 Add the fettuccine and mix well to combine. Stir in the cooked shrimp and serve immediately garnished with a bit of extra grated cheese and some parsley.